Viva la France! 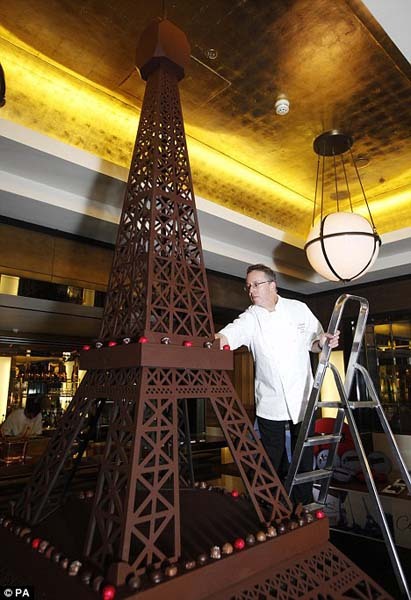 Even though it's of a famous French landmark, this chocolate tower of tastiness was built in London! Chocolate supplies globally are scarce, but the cost didn't deter these guys from making this chocolate landmark. Do they need any help taking it down I wonder? A 12ft-high model of the Eiffel Tower made entirely out of chocolate gave busy commuters a glimpse but not a taste of Paris today. The mouthwatering version of the famous landmark attracted hungry-looking glances when it appeared at St Pancras railway station, from which the Eurostar departs for the French capital. 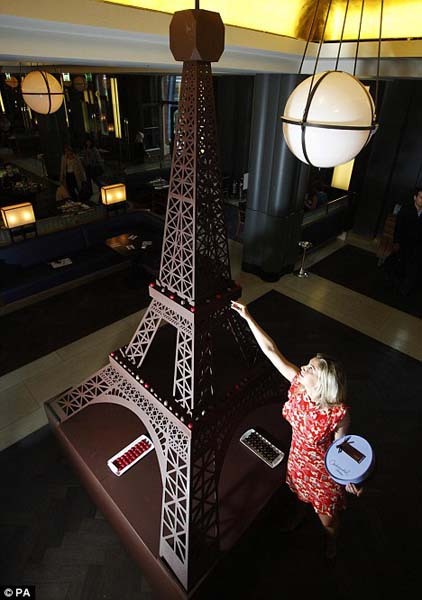 But passers-by hoping for a taste were out of luck as the tower was constructed to mark the launch of a new range of Thorntons European city-chic inspired chocolates and will be touring stores throughout the country over the coming weeks. The Continental City Boxes are themed around either Paris, which features milk chocolates, or Milan, which is for dark chocolate lovers, and are designed to reflect the traditional flavours and style found in each city. The boxes feature five new chocolates, including a gingerbread and hazelnut number called Pain D'Epices, alongside the favourites that consumers will already know from the Continental range. Keith Hurdman, Thorntons' Master Chocolatier, says: 'This is an exciting addition to the incredibly successful Continental range, and is sure to surprise and delight both our existing Continental lovers and those who have not tried it before. But chocolate lovers face bitter news as the price of their favourite confectionary looks set to soar. Cocoa prices have hit a 24-year high as the market faces its biggest shortage for 40 years. The price rise has been sparked by poor harvests of cocoa beans on the Ivory Coast, which grows 40 per cent of the world's cocoa. The El Nino weather phenomenon has also hit supplies from Indonesia, the world's third largest producer.